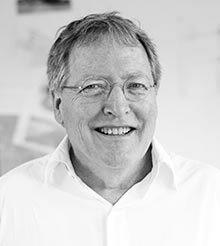 Since founding the firm in 1985, Skip Burck has led a team of landscape architects and designers in the conception and construction of spaces ranging from urban and mixed-use to institutional and residential. He received a Bachelor of Science with Honors in Landscape Architecture from Michigan State University and studied furniture design, industrial design and graphic design as a Merit Scholar in the Master’s Degree Design Program at Cranbrook Academy of Art. He received a Master in Landscape Architecture from the Harvard University Graduate School of Design (GSD). He is a Rome Prize Fellow of the American Academy in Rome and a Fellow of the American Society of Landscape Architects. Skip has taught or lectured at the GSD, Mount Holyoke College, Rhode Island School of Design and the Boston Architectural Center. He has led several substantial design efforts for the BSLA as Co-Chairman of the Urban Street Tree Planting Symposium and for the BSA as Chairman of the South Boston Seaport District Redesign Open Space Committee. He continues to be involved in the Boston design community, most recently as lead juror in the Design Jury for the 2008 BSLA Awards.